Travel back in time as you get lost in the medieval city of Girona, before discovering the rugged and unspoiled beauty of the Costa Brava. 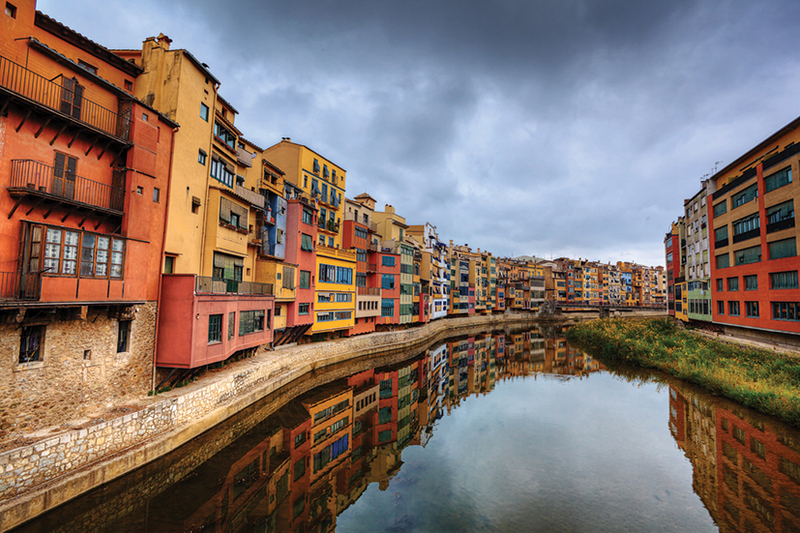 Journey to the Costa Brava and visit the colourful Roman city of Girona, a melting pot of cultures. Explore the winding medieval streets of the Jewish quarter, walk along the Roman wall that surrounds the old town, or discover the Arab Baths. Afterwards, we visit the pristine mediaeval village of Pals before heading down the coastal route to admire the breath-taking sea-views, cliffs and coves of the Costa Brava. We stop in Calella de Palafrugell where you can walk around the rocky coast, sunbathe and swim, or visit the botanical gardens set on the cliff tops of Cap Roig. The tour leaves Barcelona from our city centre office opposite the famous Palau de la Musica monment at 8:30am and heads straight up to Girona, a well-established city that has survived many a siege in the course of its long history, since its founding in around 76 BC. It has been dominated by many different people, and, as a result, has a great richness of architectural heritage. The Cathedral, founded in 1038 on the site of a former Mosque, and the spectacular Roman walls, along which you can walk, are just two examples of this. There are a wide variety of museums and sites of historical interest in Girona, such as the Jewish Call and the Arab Bath house. If you prefer, the narrow streets of the old town are very pleasant just to wander around, indulge in a spot of window-shopping, or find a secluded café and sit back to watch people pass by. From Girona, the tour heads to the impossibly charming Pals, a small medieval village that grew out of what was once a fortress. The name of the city comes from palus, the Latin word for marshlands, as this is what the fortress used to be surrounded by. More recently, the town’s beach became famous as the location of the masts for Radio Liberty, a US radio station used to broadcast pro-capitalist programmes into the Eastern bloc during the cold war; the masts can still be seen. From Pals, we head to the fishing village of Calella de Palafrugell. This delightful escape has whitewashed houses that reach right down to the sea-front and a number of traditional restaurants - perfect for a leisurely lunch. You can also explore the rocky coastline, take a dip in the inviting waters, or follow the coastline round to the beautiful cliff-top botanic gardens at Cap Roig. If the Costa Brava is what really appeals to you, then take a look at our Dalí Day Tour, which reaches even deeper into the Costa Brava. From Calella de Palafrugell we will return to Barcelona, arriving at 7pm.